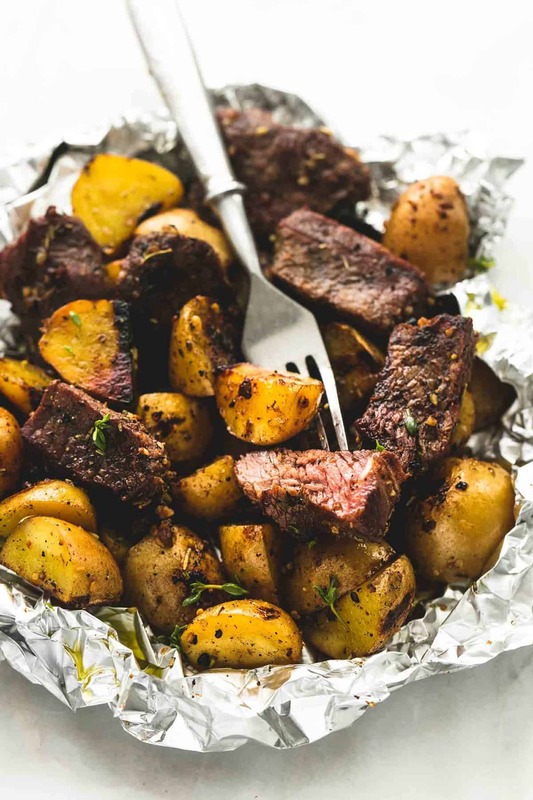 Divide steak and potatoes between four 12x12 inch sheets of foil, then wrap the foil tightly around the contents to form your foil packs. Grill over high heat for about 10 minutes on each side or until steak and potatoes are cooked through OR bake at 425 degrees for about 20-25 minutes until cooked through to desired doneness (see note). Be sure to cut your steak into pieces that are at least 2x2 inches, and potatoes into pieces smaller than one inch. This ensures even cooking. **For medium doneness on the steak, boil the potatoes first for five minutes before adding to the bowl and proceeding with the rest of the recipe. This will help them to cook faster once in the foil pack.